Three matches in and we’ve already learned a lot about Johann Van Graan’s vision for this Munster team. The 37 year old’s arrival has brought an injection of energy, as you would come to expect, but an array of changes to the team’s style too. It is early days and all early indications are positive, but we don’t yet know whether or not this initial success will be sustainable. What we do know is that any potential success will be achieved by taking a different approach than his predecessors. Rassie Erasmus and assistant Jacques Nienaber made an enormous contribution to the province in their memorable 18 months here. The South Africans strived in adversity, brought stability back to the men in red and left us in a better place. In doing so they implemented a gameplan moulded around their philosophy on the game rather than adapting to Munster’s strengths and weaknesses. Munster hired them to do their thing and they did just that. Most noticeable was the no-contest policy in defence. Rather than the Munster forwards making nuisances of themselves and slowing down opposition possession as they traditionally would, Nienaber prioritized fanning players out across the park, ensuring we were never at a numerical disadvantage. It absolutely worked, but in order to do so, a couple of sacrifices were made. Although defensively sound, Munster were never quite as nasty an opposition for those 18 months as they were against Leicester last Saturday night. There is more emotion and individuality in the new strategy, the crowd were fully engaged and energized in the home games against Ospreys and Leicester – whether the results will follow the excitement is another question. Van Graan’s apparent enthusiasm to compete and scrap looked to have brought back the very best of Peter O’Mahony. The 2017 Lions test captain’s leadership and value at lineout-time was never in doubt, but could the all-action animal of a couple of years ago have been reborn by a return to his comfort-zone? His two turnovers against Leicester certainly suggests so. 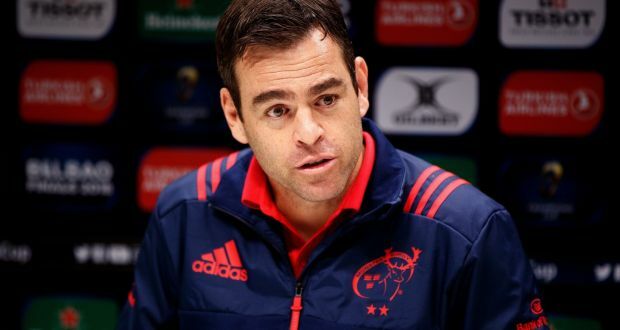 That particular performance of jackling and contesting over the ball was little more than the norm before Rassie’s stint, but now with Van Graan’s willingness to utilize the resources available to him, Munster could become one of, if not the most deadly breakdown operators in the European Cup. Siding O’Mahony this season has been the phenomenal 5’9 Chris Cloete, another man who knows his way around a ruck better than some know their way around their own home. Both player’s constant donkey-work should open opportunities for one another to pounce on unprotected possession as Cloete, Super Rugby’s turnover king of 2017, is without doubt no stranger to winning penalties for his side either. Erasmus’ signing of the 26 year old looks to have made Munster a complete nightmare to try and build phases against, but the addition has also supplied Munster’s own attack with clean possession any time he has played to date. Indeed, in the matches against Ospreys, Leicester and (in flashes) Zebre, Munster offered more positive signs of growing their attack than seen previously as the tireless work of the likes of O’Mahony, Cloete and Holland enabled the backs, and Ian Keatley in particular, the time and space required to express themselves. But not only that as tip-ons between forwards, helping change the point of attack have become a real theme of our play in the past month too. This is a simple but effective weapon in the arsenal that can send the likes of CJ Stander that couple of yards further beyond the gainline with each impact. Right now the sample size is small but it’s content has been outstanding. Should Munster continue to be as clinical this evening away from home, then it’s probably okay to start getting excited. Can Van Graan’s Munster do what Axel’s Munster and Rassie’s Munster failed to do? We don’t have to wait long to find out.